Despite having witnessed Cheeky scouring Krazy Town for a copy of The Mystery Comic each week since Cheeky Weekly began publication in October 1977, until the 30 September 1978 issue we had only ever seen one character from said perplexing publication - Mustapha Million. 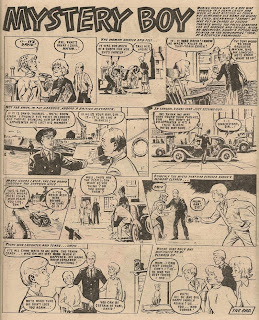 The aforementioned 30 September 1978 comic was the first of a run of 37 issues of Cheeky Weekly in which the whole of The Mystery Comic occupied its centre pages. Among the Mystery Comic strips in that issue was Mystery Boy. 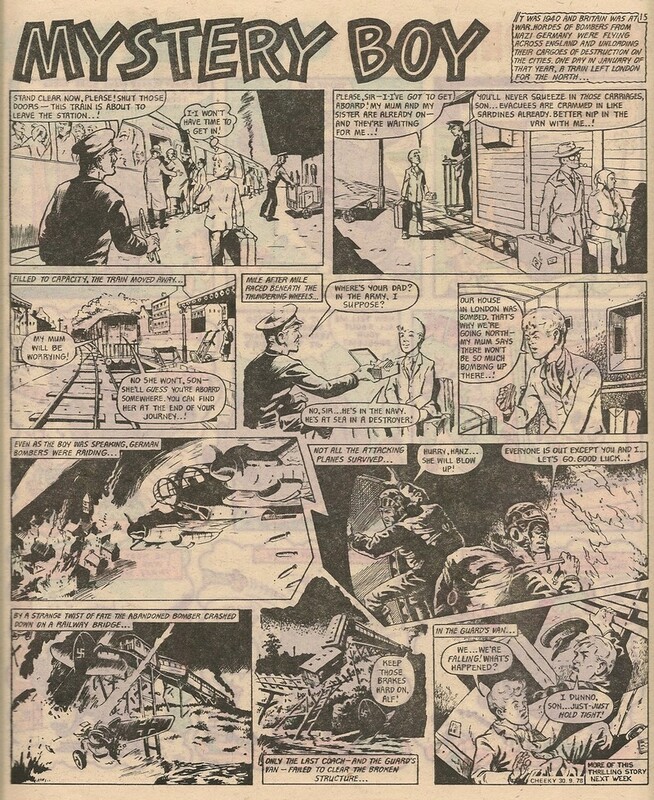 Mystery Boy was the only serial story to be printed in The Mystery Comic during its run in Cheeky Weekly. It was therefore fortunate for readers of the toothy funster's title that the first full edition of The Mystery Comic to be printed in Cheeky Weekly contained Mystery Boy's initial episode. Chronologically the seventh Cheeky Weekly feature to consist of material reprinted from IPC's vaults (not counting the various one-, two- and three-offs included in the Old Comic series), and the second to be sourced from the company's long-running title Whizzer and Chips (the earlier W&C reprint was Archie's Angels), Mystery Boy had originally appeared under the title 'Who Is Sandy? ', commencing in W&C's 02 January 1971 issue. Mystery Boy was set early in World War II. 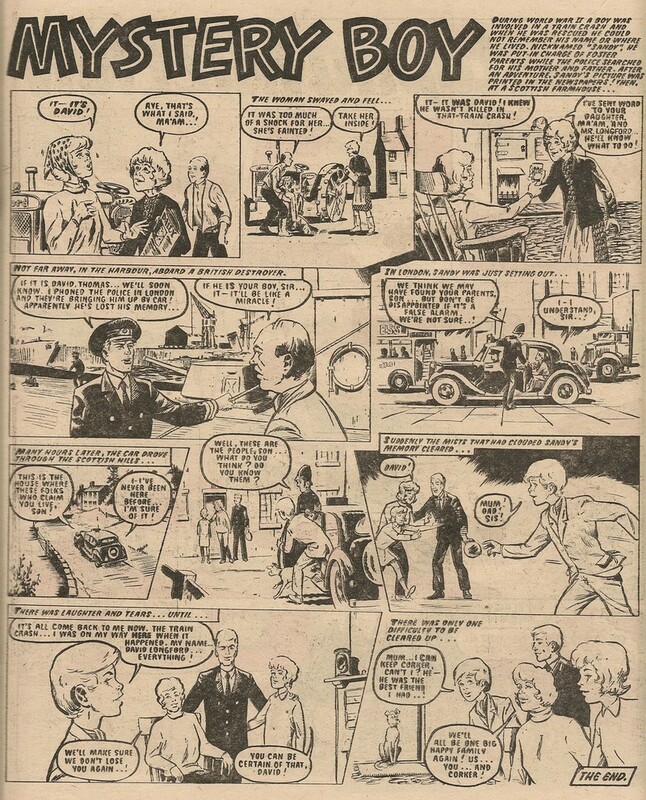 Although the war had ended 33 years earlier, when Cheeky Weekly began re-running Sandy's adventures, a comic story with a wartime backdrop was not unusual. The second global conflict was a prominent element in British popular culture as the 1970s drew to their turbulent conclusion. In a Britain beset by industrial strife, it would seem that a significant proportion of the adult public were nostalgic for a period perceived to be one where 'we all pulled together'. TV schedules were peppered with dramas (and a perennial comedy featuring the Local Defence Volunteers/Home Guard) set in WWII.. Kids as always enjoyed action stories, and thus many late 70s comics still featured tales of valour set on land, sea and in the air during the 1939-45 war. The second episode finds our young hero gripping onto a suitcase as it is propelled along the fast-flowing river. His mother and sister are among the survivors of the crash, but fail to see our hero as he is swept away. Two days later, Mystery Boy's unconscious form drifts onto a sand-bank at the river's mouth, where he is discovered by a pair of fishermen. When he's been revived, our hero realises he has lost his memory. Inspired by the location in which they found him, the fishermen decide to name the unknown lad Sandy. The young amnesiac determines that he will find out who he is and from where he came. An incident-packed tale unfolds over the following 50 episodes, as Sandy eventually remembers the name of the street in which he lived, but is dismayed on arrival to find it has been destroyed in a bombing raid. Scrambling among the rubble he discovers a smashed frame containing a photograph of a woman he recognises and suspects may be his mother. This clue leads him to Cornwall. Along the way Sandy is befriended by a stray mongrel dog who he names Corker. As he journeys west, Sandy sees a German bomber shot down and is taken hostage by the two surviving aircrew. Sandy eventually escapes his German captors, who are taken into custody by British soldiers. News of Sandy's action in assisting the capture of the bomber crew reaches a British officer, who orders that our hero be tracked down. Sandy, whose sole intention is to find his family, decides that he will evade the military and the police, fearing he will be detained and prevented from finding his parents. 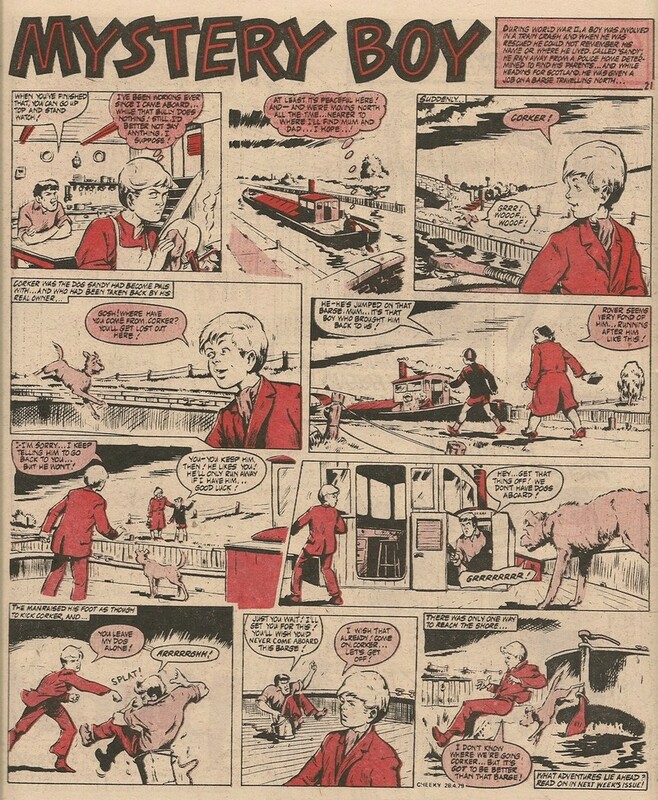 As the quest continues, Corker's owner reclaims the dog (whose real name, it turns out, is the rather unimaginative 'Rover'), leaving a miserable Sandy to continue the journey alone. However, it's not long before Corker runs away from his original owner and is reunited with our young hero. Seeing how happy Corker is with Sandy, the dog's owner lets Sandy keep him. Mystery Boy, who is evidently something of a jinx when it comes to aircraft, witnesses another bomber crash. This time it's a British bomber limping home after an encounter with the Luftwaffe. Sandy alerts a policeman to the location of the British aircrew, then continues his journey. Sandy's four-legged chum is injured during the pair's foiling of an armed robbery, but makes a full recovery. Having travelled all the way from London to Glasgow via the not insignificant detour to Cornwall, Sandy locates the lady he has been told was the one in the photo. Sadly, it turns out she is someone entirely different. At this point it becomes clear that Sandy, who we cannot fault in terms of tenacity and pluck, may be somewhat lacking when it comes to IQ, as the lady points out that the back of Sandy's precious photo has the address of the photographer printed on it. Whereas most people would at this point succumb to the lure of a good meal and comfy bed, gladly handing themselves in to the authorities, indefatigable Sandy and his equally determined canine companion set off for the photographer's Blackpool address. Further mishaps befall our young hero as he attempts to track down the photographer - he is directed into an abandoned mineshaft by an unbelievably irresponsible mine-worker, and plummets into the inky depths. After surviving this latest trauma, Sandy finds his way on to a British motor-torpedo boat just as it leaves port to engage with a German convoy. Needless to say, the torpedo boat is struck by enemy fire, casting Sandy and Corker into the English Channel, and the pair are washed up on a French beach. On his arrival back on British shores (thanks to a sympathetic French boat-owner, willing to risk the wrath of occupying German forces), Sandy is apprehended by British troops patrolling the seafront and ends up being fostered by a rather unpleasant couple. By now, readers are becoming all too familiar with Sandy's unending streak of bad luck, so it comes as no surprise when his foster home is bombed. However, some good results from our hero's latest predicament, as a press photographer takes a snap of Sandy and Corker as they are pulled from the wreckage. The picture features prominently on many of the following morning's newspapers (although why Sandy should be singled out for this treatment from among the thousands of families bombed out of their homes remains unclear). All 52 Mystery Boy episodes were single-pagers; 48 were in black and white, and 4 featured red spot colour. The story was present in all issues of Cheeky Weekly from 30 September 1978 to 13 October 1979 inclusive, but The Mystery Comic section came to an end in Cheeky Weekly's 30 June 1979 issue, so subsequent Mystery Boy episodes were, like all the erstwhile Mystery Comic features, no longer gathered around the centre of the host title but instead assimilated into Cheeky Weekly's pages. Our fugitive pal was one of two amnesiacs to feature in the Mystery Comic/Cheeky Weekly, the other being Elephant On The Run (unlike 'Sandy', Elephant's memory sadly remained unrecovered). A jarring transition between the episodes dated 04 and 11 November 1978, wherein the latter instalment picks up from a point that is different to the former's cliff-hanger, suggests that at least one episode was edited out of the Cheeky Weekly reprint run. Presumably the original title of the strip was changed to tie it in with The Mystery Comic. Title banner from first episode of the story's original run. Mystery Boy was promoted on Cheeky Weekly's covers dated 07 October 1978 (in which the second MB instalment appeared) and 10 February 1979. On both occasions, the image used on the cover was sourced from the artwork of the episode appearing within the comic. UPDATE 22 November 2018 - Thanks to Lew Stringer's post I have been able to assign John Richardson as the Mystery Boy artist. 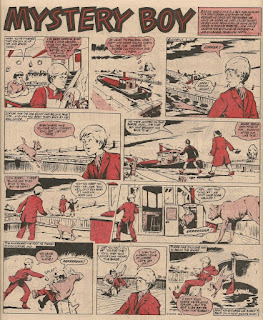 John's work had previously featured in Cheeky Weekly's Space Family Robinson strip, although that work was of course done later than Mystery Boy's reprinted art.